Rose used to have a sister named Fern – now she doesn’t and nothing has ever been the same. 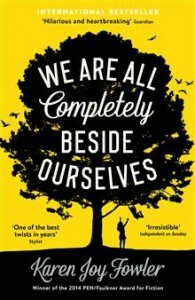 We Are All Completely Beside Ourselves is Rosemary’s story about her complex and unique family unit and the impact that the loss of her family members has had on her. Rose doesn’t tell us everything about her family straight away (and we won’t give it away either), but her slow reveal of details makes her story all the more compelling and believable. Our Book Club had polarized views on this novel. Some readers were unable to maintain their interest in Rose and her relationships once the details became clearer. Other readers found it an interesting and entertaining exploration into a complex and unique family dynamic and how its members deal with grief, loss and the struggle to move on in some way. The novel also raises how displaced Rose is, both within her fractured family and socially elsewhere in her life. The ending was realistic, tear jerking and powerful for the readers who loved the book. This novel is for readers looking for something a little different and who are willing to be challenged about their ideas about family. If you know what it’s like to not be able to move on or let go, or to struggle to find a place to fit in, then we recommend this one for you. This entry was posted in Awards & Prize Lists, Book Club Kits, Book Reviews, Fiction, Recommended Reading by Parra Reader. Bookmark the permalink.